Fill out this form for a Request for Quotation. 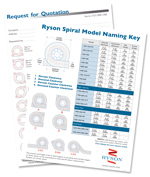 Ryson will reply quickly with appropriate model information and pricing. The position and length of the in-feed tangent on up spirals and out-feed tangent on down spirals can be customized to meet specific layout requirements. Samples are shown below (A-EX, B-MA and C-EX).